1 Period measured, December 31st 2014 – December 31st 2015. Is the market healthy or unhealthy? Institutional investors control approximately 75% of the market’s future direction, which is why we aim to keep ‘in sync’ with them. If you don’t, it feels like trying to swim against a strong current. When you don’t get in sync, you often get hurt financially and that’s why we like to see if the 800-pound gorilla investors are buying, because when they do, it strengthens the market. However, if they are selling, it weakens it. The other thing we like to keep a close eye on is the behaviour of leading stocks. If the markets best stocks are acting weaker than the general averages, it’s negative. However when leading stocks are outperforming the market, it’s positive. Take a look at this 20-year chart of the NASDAQ Composite and you’ll see that the bull market that began in March 2009 (Point A) is still in play. 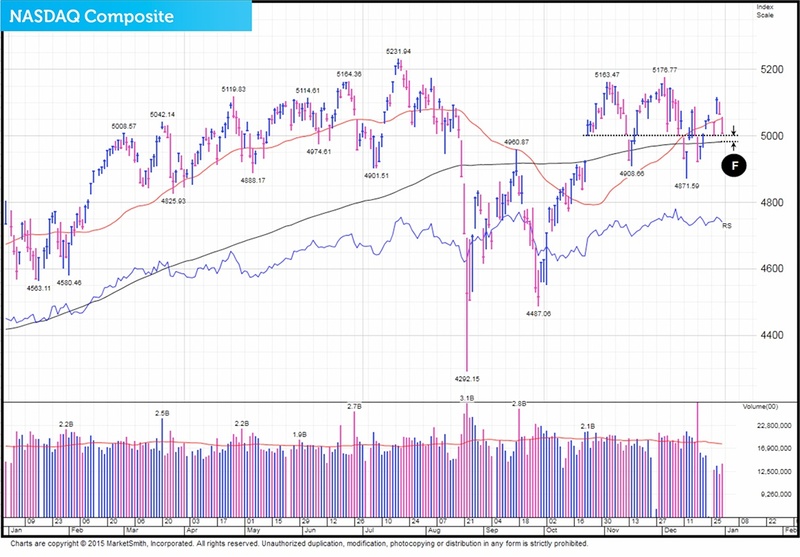 Since the uptrend began, the NASDAQ Composite has made a very impressive return of 295.5%2. However, to make that gain it has had to experience four quite challenging corrections. The first (Point B) occurred from April to November 2010. The second (Point C) is a correction that started in May 2011 and ended in January 2012. This second one was quite harsh and resembled a ‘mild’ bear market’. The third (Point D), began in late March 2012 and finished March 2013. The final one is occurring right now and resembles the 2011 retracement. This one therefore also has the hallmarks of a ‘mild’ bear market and it began last July (Point E). 2 Performance data taken January 1st 2016. On Friday January 8th, we wrote in our Daily Market Update…. ‘In situations like we are in right now where many amateur investors are panicking, we’ve found that it’s always best to remain calm and stick with the facts. 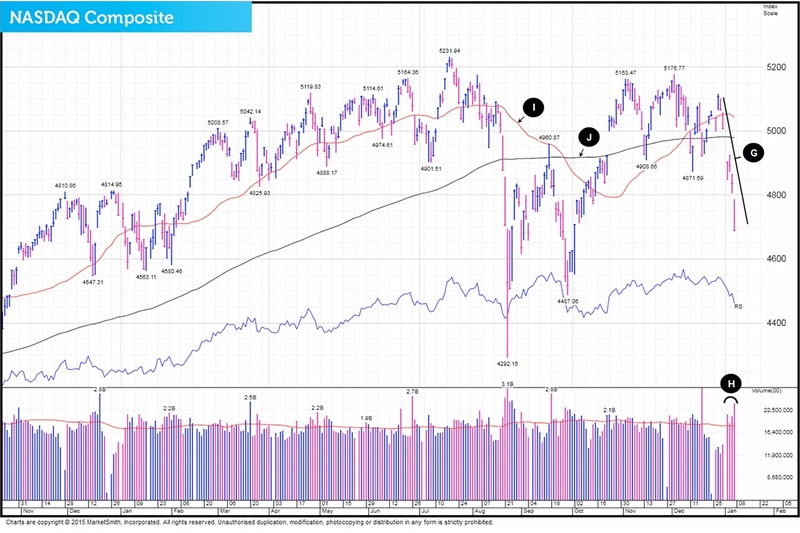 If we once again take a look at what has occurred recently, on the minus side, the NASDAQ has fallen 8.2% over the last six market days (Point G) and the last four days of drops have come in above average trade (Point H). The Composite is also currently trading below its 50 (Point I) and 200-day moving averages (Point J). 1) The NASDAQ’s 8.2% loss over a six day period is abnormal and simply cannot be sustained. It’s also classic ‘panic selling’. 3) Our portfolio (and the stocks the funds own) are so far holding up fairly well – if something was wrong or had changed, they’d be imploding. 4) The basket of leading stocks that we watch are also behaving as they should be. Just like the stocks that our funds are invested in, if something had changed, these leading stocks would be technically in a mess and yet at this moment in time, they are doing fine. On Friday January 8th the index and stock action was neutral. The NASDAQ Composite fell 0.98% (Point K) in above average volume (Point L). A drop in fast trade indicates institutional selling which weakens the market and makes it prone to potentially further falls. Leading stocks action however was positive. For a third day in a row, we noticed that many of the best equities were fighting the market. We also saw that a very small number of leaders fell in fast trade. On Friday the count was just thirteen, yet another clue that this recent selling is most probably panic, irrational and uninformed. As always, if you have any questions or thoughts on the points covered in this post, please leave a comment below or connect with us @ISACO_ on Twitter. As we grow our wealth, you grow yours. Together we prosper. ISACO are a specialist in ISA and SIPP investment and together with our clients have an estimated £75 million actively invested3. To help investors like you, we offer a high end service called ‘Shadow Investment’. Put simply, we invest and you invest beside us. As we grow our wealth, you grow yours. How does Shadow Investment work? Shadow Investment allows you to look over our shoulder and buy the same investments that we are buying. It’s an intensely personal service which gives you the opportunity to piggyback on our expertise and makes investing easier, simpler and much more enjoyable. We have an active investment strategy which aims to control risk and deliver superior performance. Over the last 18 years4, we’ve beaten the FTSE 100 by 99.7% and over the last 3 years5, we’ve made an average annual return of 9.8% versus the FTSE 100’s 1.9%. If you have over £250,000 actively invested, click here to arrange a free financial review (valued at £495) with Paul Sutherland, ISACO’s Managing Director. 3 Internal estimation taken January 1st 2015 of total ISA and pension assets owned by the ISACO Investment Team and ISACO premium clients. 4 December 31st 1997 - December 31st 2015 ISACO 121.0%, FTSE 100 21.3%. 5 December 31st 2012 – December 31st 2015.